Serious Seeds has over 20 years of experience in the development of cannabis seeds and that makes them an important player in the seed world. Serious Seeds has several delicious strains, all of them are worth a try. Order these seeds easily and fast in our shop. 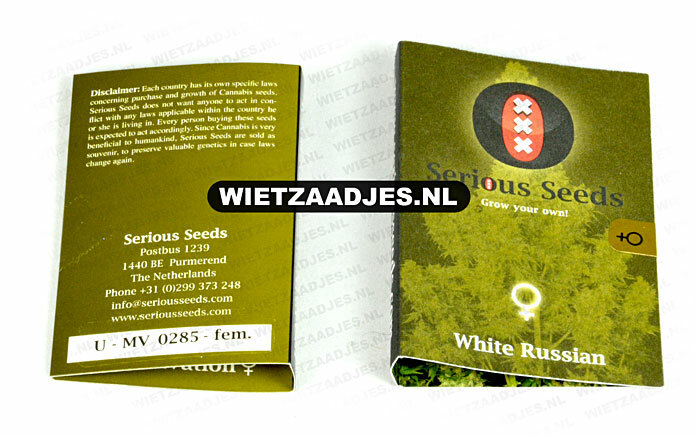 Serious Seeds is a small breeder that offers only feminized cannabis seeds from good till very good quality. Biddy Early from Serious Seeds are easy to grow cannabis seeds which are easy to grow. Resistant against diseases and fungi and the cannabis of this plant gives a pleasant high feeling. Chronic from Serious Seeds are feminized cannabis seeds which are suitable for indoor and outdoor grows. This cannabis strain won a number of prizes. She produces nice weed buds that deliver a very good yield. Double Dutch from Serious Seeds are feminised cannabis seeds which are suitable for an indoor and an outdoor grow. The weedplant needs some support, because of the heavy branches she gets. The effect is a pleasant and relaxing high. Kali Mist from Serious Seeds are feminised cannabis seeds which are suitable for indoor and outdoor grows. This weed strain won prizes and is also grown as medicinal cannabis due het effect against, for example pain. Motavation from Serious Seeds are feminised weed seeds which have mainly Indica genetics. This cannabis plant remains small, but delivers a good yield. She is also grown as medicinal cannabis. Serious 6 from Serious Seeds are feminised cannabis seeds which are sutiable for indoor and outdoor grows. This almost pure Sativa cannabis strain has a short flowering time and is resistant against diseases and fungi. Warlock from Serious Seeds are feminised cannabis seeds which is also grown by her medicinal purposes. This prizewinning cannabis strain gives a powerful high feeling and is suitable for indoor and outdoor grows. White Russian from Serious Seeds are feminized cannabis seeds that deliver a nice yield of cannabis. The seeds are suitable for indoor and outdoor grows. The effect if powerful and this strain is also grown by her medicinal characteristics. White Russian #1 Auto from Serious Seeds are autoflower cannabis seeds that are suitable for an indoor and an outdoor grow. The cannabis plants have mainly Indica genetics and growing this weed strain asks for some experience of the grower.